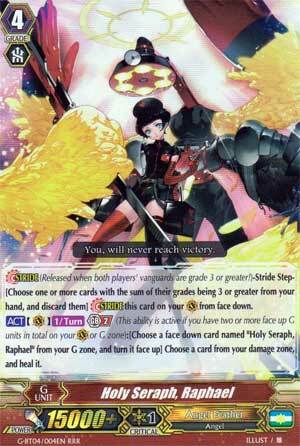 [Stride] (Released when both players' vanguards are grade 3 or greater! )-Stride Step-[Choose one or more cards with the sum of their grades being 3 or greater from your hand, and discard them] Stride this card on your (VC) from face down. [ACT](VC)1/Turn Generation Break 2 (This ability is active if you have two or more face up G units in total on your (VC) or G zone):[Choose a face down card named "Holy Seraph, Raphael" from your G zone, and turn it face up] Choose a card from your damage zone, and heal it. The sum of your efforts in G Angel Feather. Raphael's GB2 ability is simple enough, just an ACT that Heals a damage for a G Persona Blast. That's actually a pretty good ability. Does nothing to power up the Pegasi or Nurse of Broken Heart, but saving yourself cards to block is as good a strategy as any. Not much to say. Doesn't do anything to kill the opponent so it has to be RG-centric to bring any hurt to the table, but still a good way to save cards. So, GB2, Persona Flip and heal 1 damage. ...That's not stupid at all. And this is why I wish I could run eight copies of this card. Best part is, if you run Legion as a back-up to Gavrial, this helps out a lot. So, yeah, run four of this if you're running it. Not much else to say, just a solid unit for G-era Angel Feathers. Remember, my ratings are based for the deck they're in, I don't compare this to things like "The Ace" or Megacolony strides after all.